You've read an awesome book and you've raved about how awesome the book was, but you still feel like your review needs something more. There are several options for review extras and some may draw in more people than a review alone would. We all know that pictures enhance blog posts. Most book reviewers insert the book's cover into their review, but did you know other images can be powerful additions to your review? During this challenge I've been creating "feature images" at the top of each post. I put the title of the post on the image and it makes a great image for social media. 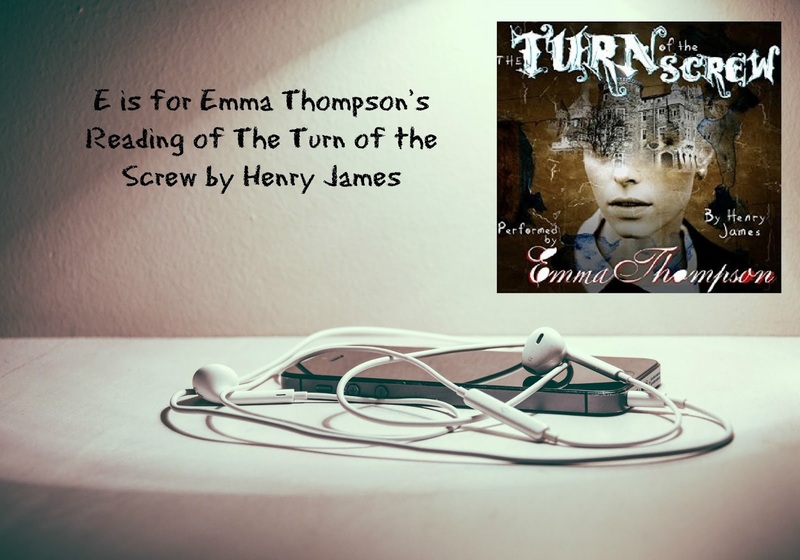 You can also include the book cover in the post image like I did for E is for Emma Thompson's Reading of The Turn of the Screw. 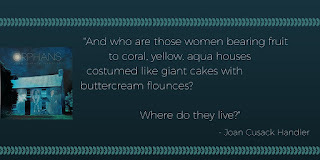 Is the book you are reviewing take you to an interesting locale? Mention historical or famous landmarks? Consider including pictures. Be mindful of copyright. It is always best to use your own pictures, but there are sites that offer Creative Commons or Public Domain images that are free to use. I like using Wikimedia Commons and Libre Stock (it's like a database of sites offering free images). Poignant quotes or emotional passages from the book can also be a nice addition. When Alison did her K is for Kiss and Tale post, she included the passages that surrounded the kiss. 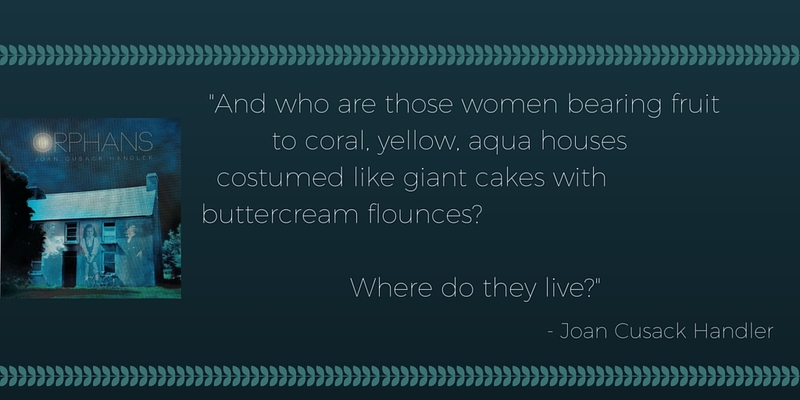 I love when authors and publicists send me image quotes like the one I used in Joan Cusack Handler's guest post on Monday. It is a double bonus since it is a quote and an image. Again, great for sharing your review on social media like Instagram and Pinterest. A number of books feature food and drink and a recipe can be a great extra for bringing in people who might not regularly read book blogs. I have featured cocktail recipes and recently after reading a few books set in New Orleans I included a recipe for beignets. Alison routinely provides a sweet snack pairing with her book reviews. Add in a picture of the food or drink and again your review can be a big hit on social media sites like Pinterest and Instagram. I haven't tried this but it is an idea - if the main character has a hobby or maybe a career with an activity like making jewelry or refurbishing furniture perhaps you could include a simple project for your readers. Did you know you can embed sample chapters and in some cases audio book clips into your review post? To embed the sample chapters, you just need to go to the book's page at Amazon and look on the right hand side under the click to buy button. There will be an "embed" link near the share buttons. Click the link and it will bring up the code you need to use to embed the content (make sure you click the radio button for the embed code). If you are an Amazon affiliate, you can add your affiliate id so that if people purchase the book after reading the sample chapters you get credit. Check out my post for A Bandit's Tale to see what the embedded chapters look like. You can embed video from YouTube that is related to the book. Deborah Harkness, author of the All Souls Trilogy, did a walking tour of Oxford and related places to her books. I've also grabbed interviews and book trailers. Sometimes the author, publisher or publicist will send me the content. Other times I search the publisher's YouTube channel or visit the author's website. Remember. my E post I mentioned above? I embedded a clip from the audio book. Audible offers a number of sample clips on SoundCloud that you can get the embed code for. This is great for reviewers who do a lot of audio book reviews, but even if you read the book it can be a nice review extra to include in your post. 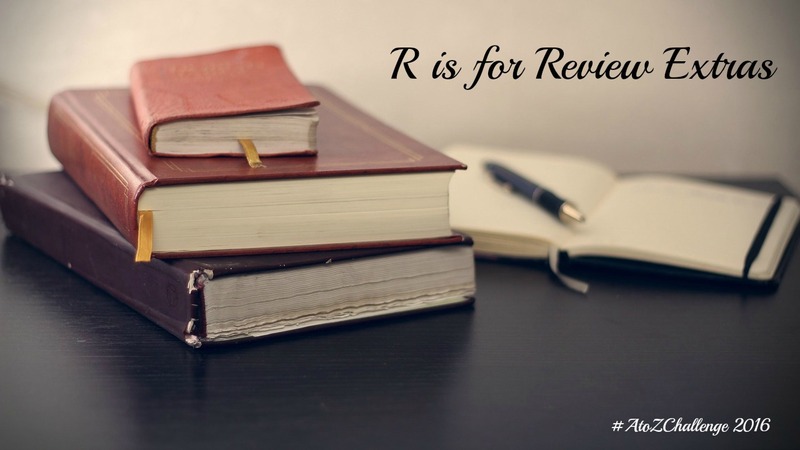 The next time you write a book review, get creative and stand out from the crowd by including one or more review extra. What review "extras" do you include with your reviews or like to see with reviews? Great tips. I usually just review the books on Amazon, but if I should ever start blogging about the reviews, these are very good tips.